Trees would look strange with spindle-like trunks supporting thick-set heavy branches. New shoots necessarily grow at the tips. Established branches and the trunk, thicken to support this expansion. My wife and I walked around a housing development site the other day – new houses being built near us. As we walked further in to the development, roads were less complete, houses half finished, before we reached a temporary fence and gate through which we could peek at groundwork for a subsequent phase. New growth building literally on established infrastructure. Across the country, roads themselves are built at the extremity of existing roads. Sensible really, as a road that is unconnected to the network is pretty useless. You only have to observe weeds pushing through paving and tarmac to see what power lies at the most delicate tip of the plant. The drive to push through, to break new ground, belying the tender fragility of that new growth. So too it would seem with our development as human beings. Growth comes at the edge. It builds on what already exists. At first it is new, a little fragile, but gradually with confidence and practice it strengthens and opens up new possibilities for learning and growth. 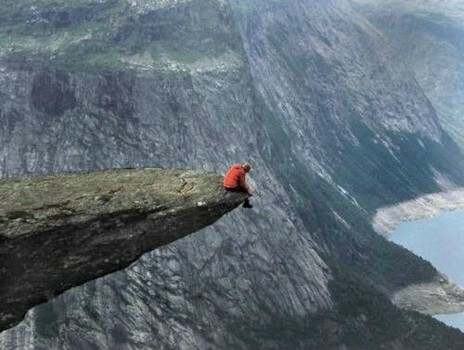 Sometimes we don’t want to go to the edge. It can be scary. A little uncertain. A little too new. We feel vulnerable. But if we don’t go to the edge, we won’t grow new shoots, expand our capability, learn more about ourselves and our potential. Stand at the edge of yourself. Branch out. Literally.